It is hard to believe, as we prepare to watch the Kentucky Derby today, that a decade has come and gone since Barbaro achieved his spectacular victory. In 2006, the Derby pulsated with a field of twenty horses who were favored to win from a plethora of perspectives shared by the racehorse industry's most respected analysts. Sharp Humor, Lawyer Ron, Sweetnorthernsaint, Bluegrass Cat and Sinister Minister represented only a few of the memorable names given to horses that year who were capable of crossing the finish line first after running a mile and a quarter. However, at post-time it was Barbaro who entered the starting gate with 3-1 odds in addition to being the favorite to win. And he did. Barbaro's win is one of the most indelible in Derby history. On the final turn that brought him in view of a deafening crowd ,jockey Edgar Prado encouraged Barbaro to switch up another gear. The horse obliged. They surged ahead of the pack and finished the race with a six and a half length lead in front of Bluegrass Cat. Race caller Tom Durkin described the feat as sublime. Of course this was the highlight of Barbaro's story. Two weeks later, at the Preakness Stakes, Barbaro suffered a catastrophic injury to a hind leg that required five hours of surgery to stabilize. Sadly, eight months later Barbaro was humanely euthanized when secondary complications from the injury proved too much for the horse to bear. 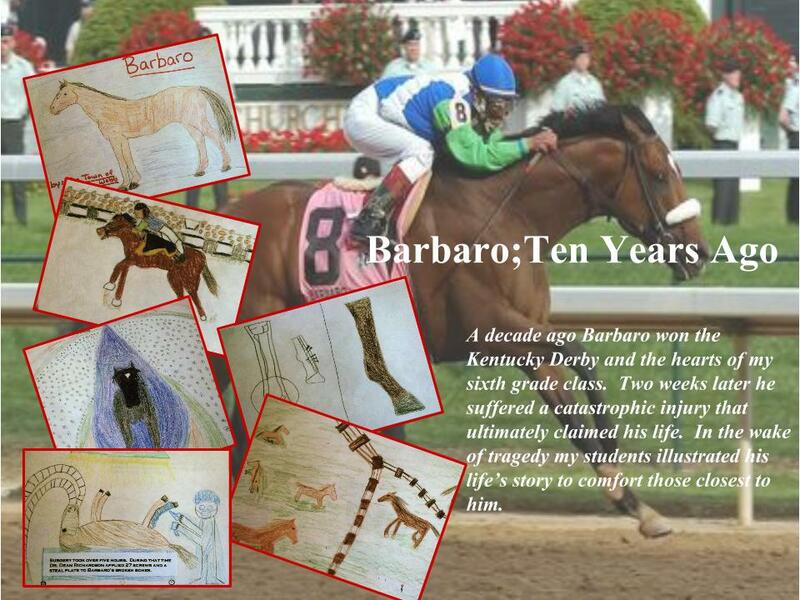 My sixth grade students illustrated the following book about Barbaro's life during the sad days following the Preakness. We sent it to Barbaro's trainer, Michael Matz who in turn passed it on to Gretchen and Roy Jackson, Barbaro's owners. I am posting the pictures today because they remind me that life goes on and although my students were deeply saddened by Barbaro's death, they were very proud of their book that brought comfort to Barbaro's connections. In the ten years since this famous race took place, the students have grown up; many will graduate from college in just a few more weeks. As their futures unfold in front of them I am confident that their small contribution to the events surrounding Barbaro's injury and death will remain with them for a lifetime.